This office wanted to update their kitchen so that it matched the feel of the unique and happy content they were creating. It makes sense that the offices behind the blog Oh Joy would be just as exciting as their content — so creator Joy Cho decided to make that a reality. Cho wanted the kitchen to become even more functional for her and her employees, while also looking great. 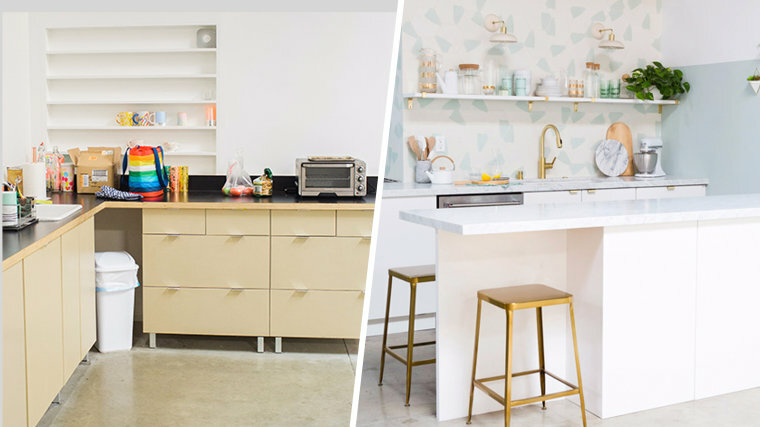 So she started a renovation to take their kitchen from drab and boring to bright and happy! "The before kitchen was very utilitarian and would serve a normal office just fine," Cho told TODAY Home. "I was ready for a real, full-functioning kitchen." To maintain a calming feel in the office, she opted for a color scheme of white, mint and gold. This unique choice was perfect for creating a space that feels relaxing and looks beautiful. Cho recently designed the tile used on the backsplash for a different project — so the renovation came at the perfect time. When it came to the cabinets, Cho opted for a clean, white option from IKEA but also made them her own by updating the countertops and hardware. They almost look custom! "I wanted to have a kitchen that also looked beautiful in our food stories and represented Oh Joy while still feeling classic over time," said Cho.